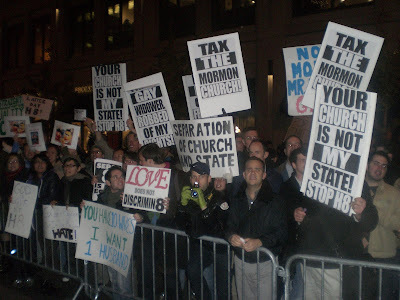 NYC's first marriage equality rally/protest was a smashing success as a crowd estimated at 10,000 - 15,000 jammed the plaza across from the Manhattan Mormon Temple before taking over Broadway and marching to Columbus Circle. Major celebrities showed their support, dozens of television crews did interviews, news helicopters hovered overhead, and in general it was just an overwhelming show of force. 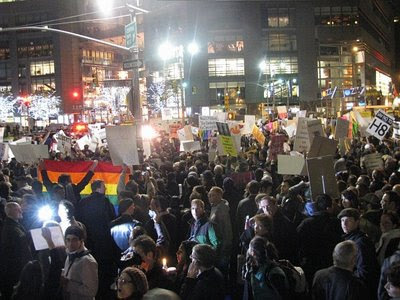 However the evening news is already teasing the story as "about a thousand people showed up." 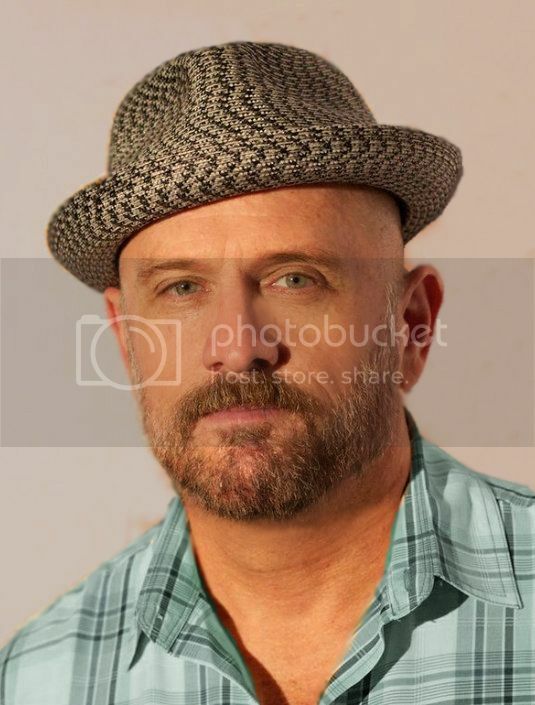 [Top photo via Blabbeando, who has lots more.] 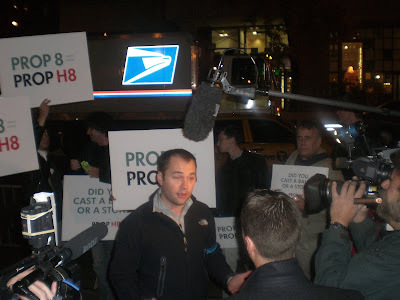 ABOVE: Organizer Corey Johnson answered questions for a sea of TV crews. 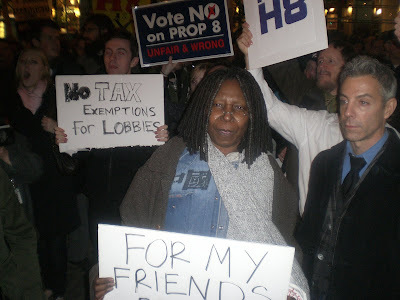 ABOVE: Whoopi Goldberg held a "For My Friends' Equal Rights" sign. ABOVE: Uber-blogger Andy Towle worked the crowd barrier as a Rally Marshall. 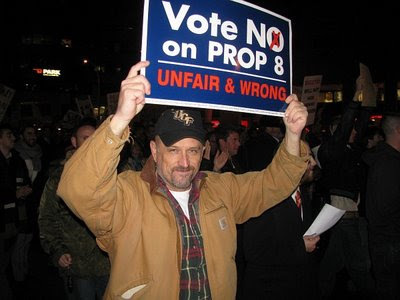 ABOVE: Eric Leven brought the videographer fierceness and Gilbert "Rainbow Flag" Baker created the massive "God Loves Gay Marriage" banner that was carried at the front of the march. Gilbert enlisted me to hold one end of the banner before I realized what it said. (It was over 50 feet long and I only saw the "marriage" part.) 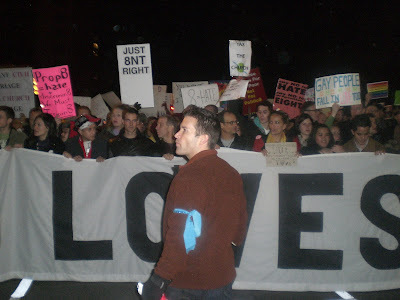 When it hit me what the whole thing said, I asked a nearby lesbian, "Do you love Jesus?" Yes, I do. "Great, hold this." I'll have Eric's video as soon as he gets it posted. 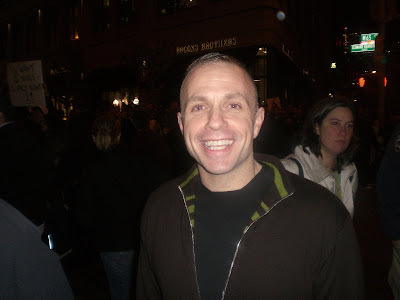 ABOVE: SiriusXM host Michelangelo Signorile was thrilled with the turnout. ABOVE: Comedian Judy Gold took the bullhorn for some hilarious chants. 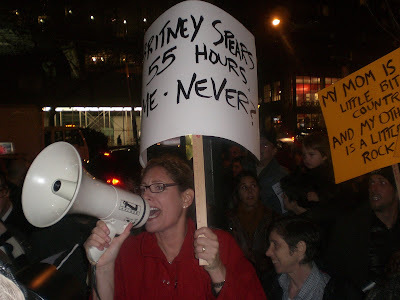 Her sign: "Britney Spears, 55 hours. Me - Never?" 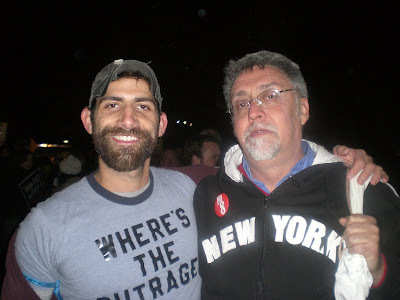 ABOVE: Andy Humm of Gay City News interviews a tot-toting gay daddy Lavi Soloway and and his daughter Lily. 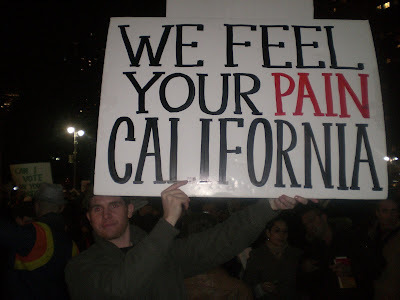 ABOVE: We all feel your pain, California. 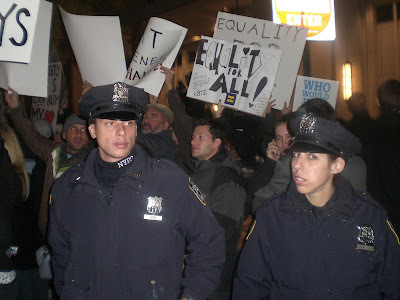 ABOVE: The NYPD was generally in good humor, but just in case they weren't, the NYCLU had protest observers on hand. ABOVE: Video by Andres Duque of Blabbeando. ABOVE: For full-screen images of this slideshow go here. ABOVE: I'm coming for YOU, Sen. Malcolm Smith. [Photo by Andre Duque.] 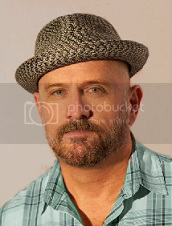 Also click over for many more pics from Bob Johnson, Little David, Father Tony and from Matthew Rettenmund who has lots of celeb photos. BELOW: Video by Father Tony and a report from the NY Daily News.